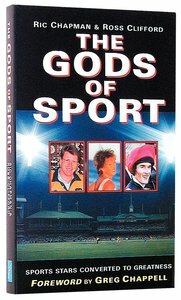 NEWRic Chapman and Ross CliffordHere are the fascinating stories of twelve Aussie sporting celebrities, including Nick Farr-Jones, Darren Beadman and Toni Ruckle, who have learnt that true greatness comes from belonging to and following Jesus. Featuringa forward by Greg Chappell, this book is a great read for Christian sportsfans and an excellent evangelistic tool! From Albatross. Twelve interviews with Australian sports stars who are Christians in different churches, including charismatic, Uniting Church, Catholic and Anglican, telling of their careers and how their Christian experiences and values influence what they do. The players, in a wide range of sports, include Peter Warner, Tani Ruckle, Steve Lawrence and Craig Warren.